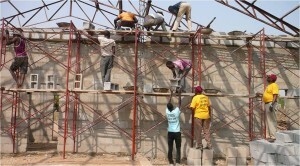 When I read in the Messenger about Nigerian Workcamps, I knew I wanted to go. As a child I became enamored with Nigeria when my pastor Bob Bowman and his young family left to serve in Nigeria. And then along with many others, my heart went out to the EYN brothers and sisters in their ongoing crisis. But when I read, hard physical labor in a hot climate, I knew that was my calling. And so, 9 of us from the US melded together in our desire to serve. The hard work was present as cinder blocks and pans of concrete passed from ground level up the scaffolding, and the tall gabled ends of the church were completed. But as we were often reminded, it was the relationships that became the most significant experiences. 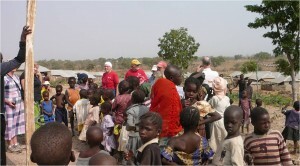 We went to visit our first IDP, Internally Displaced Persons, camp, children excitedly ran behind our van. As we descended, the children eagerly gathered around us, thirsty for our attention. No toys or planned activities were seen on the site. We were shown a small tin roof school with a few desks. We crowded inside. There was not enough room for all to sit. But the saddest part, there was no longer a teacher at the camp. Some of our Workcampers visited the adults in their dwellings. I stayed with the children. I started throwing a frisbee but couldn’t get across the concept of forming a large circle. All wanted to be close to me and the frisbee. Soon we broke into groups and the older boys took the frisbee. I began tossing a ball with some others when a noticed a group of toddlers and shy older kids standing alone. I started singing children’s songs with them. The words were primarily sung by me in English, but the motions were shared by everyone. 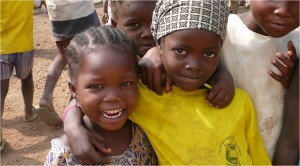 It was hard to say goodbye to these children. close by. To my surprise, it was the mothers, with varying degrees of English, who were anxious to learn the songs. They wanted to sing them with their children and teach them at children’s church activities. We shared many songs. My repertoire of children’s songs were called upon another day as a group of mothers and children sat under the canopy. After singing many of our songs, we asked the women to teach us one of their songs. We learned it in Hausa and English. “I must go with Jesus anywhere. No matter the roughness of the road. I must go. I must go!” Literally and figuratively, these women have traveled many a rough road. 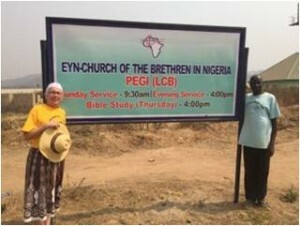 On our last Sunday, we traveled the hour to worship with our new friends in Pegi. 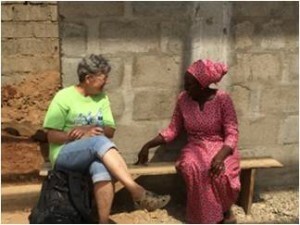 Sitting within the newly completed block walls with the roof overtop, we unified our voices. Choirs sang and praises were expressed. As I sat, I silently prayed that I could be particularly aware of God in our midst. Before long, a young child came and stood near me. I had not seen this child before and wasn’t sure if the child was a boy or girl. Later I learned her name was Mary. There she stood, looking at me. I asked if she wanted to sit on my lap. She did. I retrieved two granola bars I had with me. She ate those as well as finished my water. I put my arms around her and she pulled them tighter. We finished the service sitting in God’s presence. This entry was posted in Nigeria and tagged Boko Haram, church, Ekklesiyar Yan’uwa a Nigeria, EYN, Nigeria, Peace, prayer, workcamps by Roxane Hill. Bookmark the permalink. Thanks, Carol! BTW, when I stopped back at the guesthouse on Sunday, Andrew the photographer was there, and asked about you. Wonderful piece. As I read it it brought memories back. I hope I always have memories of this time. Let’s do it again sometime. 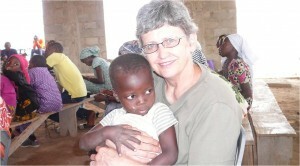 I love this story Carol – it is such a good portrait of the Work camp #2. So glad that you wrote it and shared with all.